As some of you know, as part of our efforts to raise money for our upcoming recording, Infernal Machines, we are offering you the opportunity to sponsor a Secret Society musician. For a tax-deductible (via Fractured Atlas) donation of $500 or more, you will be credited in the liner notes: "[MUSICIAN'S NAME] appears courtesy of [YOUR NAME]." Plus you will get an exclusive autographed photo and thank-you note from the musician you've sponsored. In the hopes of encouraging more people to take advantage of this, from now until Dec. 15, I'll be posting more info about the amazing musicians who will be appearing on this recording. Today we begin with Erica vonKleist, who leads our wind section. Erica's a West Hartford native who moved to New York in 2000 to study at the Manhattan School of Music. She finished her studies at Juilliard after they launched their jazz program, earning the first Bachelor's Degree in jazz in the history of the school. Since 2003, she's been a member of the Afro-Latin Jazz Orchestra under the direction of Arturo O'Farrill. 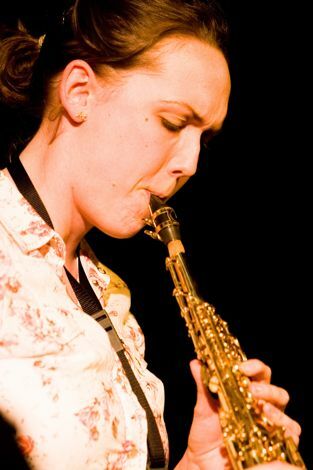 She plays flute in Chris Potter's Tentet, and is featured on last year's Song for Anyone. In 2006, Erica released her first album as a leader with her band, Project E, and she will soon begin recording for her next project. She also paints! Erica has been a Secret Society co-conspirator ever since our first gig back in May 2005. In addition to being a kickass improvising saxophonist, Erica is like a scarily good flutist. A lot of jazz saxophonists can double on flute well enough to get by in most casual situations, but Erica is actually serious about the instrument. This means I can write real flute parts for her in Secret Society, which is awesome. Erica is featured on alto flute and soprano sax on "Chrysalis" (click to listen; right/ctrl-click to download). She is sad that she almost never gets to play her main horn in this band, so one of the new pieces I'm working on will be an alto sax feature for her. Click here to sponsor Erica's appearance on our recording.